Percutaneous ethanol injection post-fluid aspiration of pure thyroid cysts and predominantly cystic thyroid nodules is highly effective in preventing fluid reaccumulation. The procedure is simple, safe and is performed in the outpatient clinic under ultrasound guidance. A coordinated approach between the physician and an experienced assistant who controls fluid aspiration and alcohol injection is essential. Before ablation is undertaken, FNA biopsy of the solid component is essential to exclude malignancy. 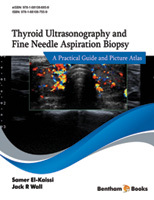 Any suspicious thyroid nodules should also be biopsied. Alcohol leakage is an uncommon but serious complication of percutaneous ethanol injection and may lead to voice changes due to demyelination of the recurrent laryngeal nerve. The trans-isthmic approach may be associated with a lower risk of ethanol leakage. Percutaneous ethanol injection is also effective for the ablation of metastatic cervical lymph nodes in thyroid cancer patients and may avoid the need for re-operation. However, ethanol ablation is not the first option in hyperfunctioning thyroid nodules and parathyroid adenomas due to poor response rates.